We are delighted to announce that in September 2018 we will be opening a new office in Southampton. With the business having seen significant growth over the last few years, we have had to look for additional office space to accommodate the increase in our numbers. We are now a team of more than 40 having doubled in the last two years and with so many skilled individuals in the company, we are expanding our service offering - great news for us and our clients. We moved our Head Office to Old Sarum, Salisbury back in November 2016, and have continued to grow apace, and this will remain the centre of Blue Frontier operations. We look forward to meeting new businesses in Southampton and to building long term relationships with new clients in the area. As a full end-to-end digital service agency, we are able to offer businesses the full expertise of our team and the convenience of sourcing all development, design, digital and IT services under one roof. So now we have a new office to fill. We are looking for skilled and motivated people to join our team. If you or anyone you know is interested in a career at Blue Frontier, please do get in touch. You can either apply through our existing vacancies page or alternatively, send us your CV and covering letter including what kind of role you’re looking for and why you’re interested in a career at Blue Frontier. Sammy enjoys thinking outside the box, finding new ways to attract and engage users. Having graduated with a degree in Media Arts, specialising in Transmedia, she has a broad knowledge of digital media, multi-platform marketing and consumer behaviour. 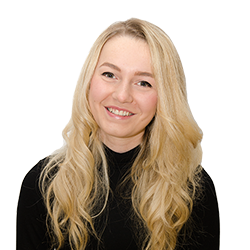 Since joining Blue Frontier, Sammy has enjoyed developing her skills and knowledge of digital marketing, and is constantly striving to think of new ways to market her clients, driving valuable organic online traffic to their businesses.